AVID Jazz here presents four classic Humphrey Lyttelton 10" albums plus, including original liner notes on a finely re-mastered and low priced double CD. Jazz Concert, Jazz Session with Humph, Humph In Perspective, Heres Humph! and the plus, tracks from Humph Swings Out. Our selections feature the great man across a diverse grouping of albums ranging from the transitional phase of Heres Humph!, where we are treated to tracks from his old band, his revolutionary band featuring tenor sax and his current band of the moment! We then look back with Humph on Humph In Perspective where he reviews his musical achievements from his position as the pre eminent UK jazz man of the era and best known band leader in Europe. On Jazz Session with Humph we hear all but one track recorded before an invited and delighted audience. 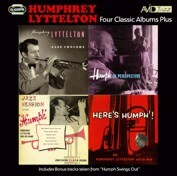 Rounded out with A Jazz Concert and tracks from Humph Swings Out we present a well rounded representation of one of the greatest British jazz musicians ever, Humphrey Lyttelton.